Researchers at Rice University's Brown School of Engineering say they can find out fast by feeding basic details of their structures to "deep learning" agents that have the power to map the materials' properties. Better yet, the agents can quickly model materials scientists are thinking about making to facilitate the "bottom-up" design of 2D materials. Rouzbeh Shahsavari, an assistant professor of civil and environmental engineering, and Rice graduate student Prabhas Hundi explored the capabilities of neural networks and multilayer perceptrons that take minimal data from the simulated structures of 2D materials and make "reasonably accurate" predictions of their physical characteristics, like strength, even after they’re damaged by radiation and high temperatures. Once trained, Shahsavari said, these agents could be adapted to analyze new 2D materials with as little as 10 percent of their structural data. That would return an analysis of the material's strengths with about 95 percent accuracy, he said. "This suggests that transfer learning (in which a deep-learning algorithm trained on one material can be applied to another) is a potential game-changer in material discovery and characterization approaches," the researchers suggested. The results of their extensive tests on graphene and hexagonal boron nitride appear in the journal Small. Since the discovery of graphene in 2004, atom-thick materials have been touted for their strength and range of electronic properties for composites and electronics. 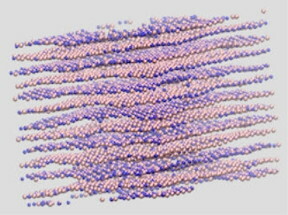 Because their atomic arrangements have a significant impact on their properties, researchers often use molecular dynamics simulations to analyze the structures of new 2D materials even before trying to make them. Shahsavari said deep learning offers a significant speed boost over such traditional simulations of 2D materials and their characteristics, allowing calculations that now take days of supercomputer time to run in hours. Shahsavari said the lab decided to study graphene and hexagonal boron nitride for their high tolerance to deterioration under high temperatures and in radiation-rich environments, important properties for materials in spacecraft and nuclear power plants. Because the Shahsavari group had already carried out more than 11,000 radiation cascade damage molecular dynamics simulations for another paper on 2D materials, they had incentive to see if they could reproduce their results with a much faster method. They ran thousands of "deep learning" simulations on 80 combinations of radiation and temperature for hexagonal boron nitride and 48 combinations for graphene, hitting each combination with 31 random doses of simulated radiation. For some, the researchers trained the deep learning agent with a maximum of 45 percent of data from their molecular dynamics study, achieving up to 97 percent accuracy in predicting defects and their effects on the material's characteristics. Adapting trained agents to different materials, they found, required only about 10 percent of the simulated data, greatly speeding up the process while retaining good accuracy. "We tried to figure out the corresponding residual strengths of the materials after exposure to extreme conditions, along with all the defects," he said. "As expected, when the mean temperature or the radiation were too high, the residual strength became pretty low. But that trend wasn't always obvious." The National Science Foundation (NSF) supported the research. Computing resources were supported by the National Institutes of Health, an IBM Shared University Research Award in partnership with Cisco, Qlogic and Adaptive Computing, and the NSF-supported DAVinCI supercomputer administered by Rice’s Center for Research Computing and procured in a partnership with Rice’s Ken Kennedy Institute for Information Technology.